We offer a range of intraocular lenses to accommodate the unique needs and goals of our patients. Our expert eye surgeon, Dr. Sonny Goel, can explain the different types of intraocular lenses at our Baltimore, MD, area office and help you make the right choice. There are many considerations when choosing the right IOL for your needs. Monofocal IOLs correct vision at a single distance, either near or far. 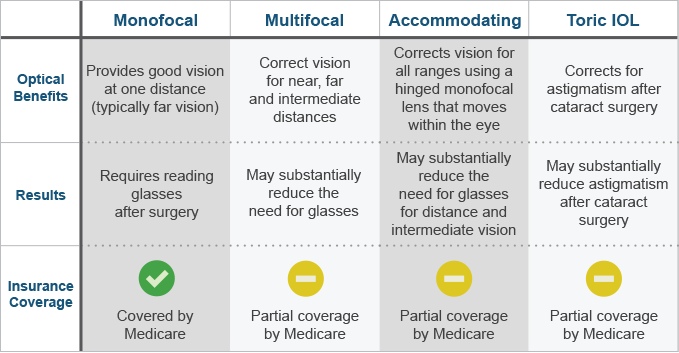 Monofocal IOLs are the most basic type of IOL, and are usually covered by insurance. Patients will require glasses following monofocal IOL placement. As we age, the crystalline lens becomes less flexible, compromising close focus. Accommodating IOLs are designed to flex like a healthy natural lens, helping patients to read, watch television, and perform other tasks without the need for reading glasses. Patients may still need glasses for reading fine print. Multifocal IOLs provide close, intermediate, and distant focus. They function like bifocal lenses, but instead of only providing two ranges of focus, multifocal lenses provide several. Some multifocal IOL recipients no longer need glasses, while others may still require glasses for tasks such as reading. Toric IOLs are designed especially for those suffering from astigmatism. They have different focus powers in different meridians of the lens, helping astigmatic patients experience a minimized need for glasses. IOLs not only have varied capabilities, but are also available in a range of focus powers, just like eyeglasses or contact lenses. During your consultation with Dr. Goel, he will assess the quality of your vision and listen carefully as you explain what you hope to achieve following surgery. For example, if you do not mind wearing glasses for certain tasks, you may be an excellent candidate for a monofocal IOL. On the other hand, if you have worn glasses for many years, and desire greater independence, you may be a candidate for a premium IOL that provides focus both near and far. Premium IOLs are not typically covered by insurance, but we can work with you to determine a payment plan that makes this option affordable on your budget. Once you have chosen a type of IOL, Dr. Goel will examine your eyes to determine the degree of correction your IOL should have. It is important to understand that vision will always continue to degrade, even after undergoing refractive surgery. In order to help you experience clear vision long after receiving an IOL, Dr. Goel offers touch-up treatments to achieve small refinements that help you maintain focus. Your vision is an invaluable asset, and Dr. Goel can help you achieve your best vision. During your consultation, Dr. Goel will discuss the benefits of each type of lens and help you decide which option is best for your needs. Contact our office today to schedule your appointment.